The present going time is very fast in which the business activities have become global because of the utilization of the large number of means the internet in particular. The Social Media sites like Facebook plays an important role in this regard because these sites are visited by lots of people that belong to every region of the globe. So here I would like to present you a collection of the Create One Page Facebook HTML Templates which you can utilize with full confidence in order to generate the outcome of your dream. 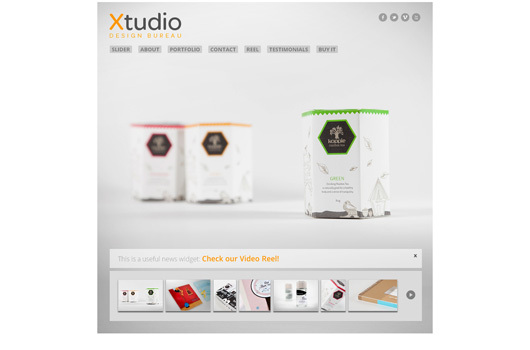 It is a great HTML theme which is fully responsive and comes into view in the form of One Page. The design of the theme is responsive and able to serve the people who want more creativity in their valuable tasks. 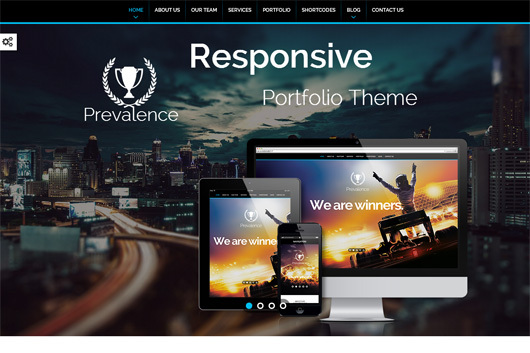 The colors and the page layout are very good looking, but if you want to change them just according to your demand, then the Prevalence theme provides you this facility as well. This theme is available to you in the Full screen form and gives you lots of features such as reworked caption, image, slides for the published and unpublished files and much more that will give you as much facility as you may need. The Leaf is an outstanding one page theme which will available to you in the form of a fully corporate theme. Basically, it is designed and produced by a Professional WordPress Development Team the main objective of which is to aid the customers with lots of the up to the minute features which you will find within this theme. After downloading the theme, you will be amazed to know that each & every page builder item that you will find here can be easily configurable and the stunning powerful options which will serve you well. The UrdanSpace is a marvelous template which is particularly designed and planned for the professional users and the theme will be available to you in the one page HTML5 portfolio shape. This portfolio template has been built with the help of a new Twitter Bootstrap3 framework that makes it a must have template particularly for those who like to establish a Portfolio project. 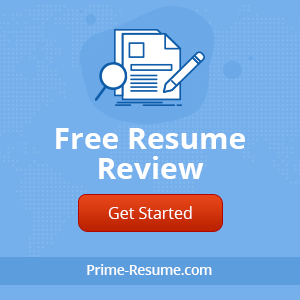 This template is well equipped with ten color schemes which are available to you in their own folder so you have ten folders all set and ready to go for the sake of better completion of your valuable job. 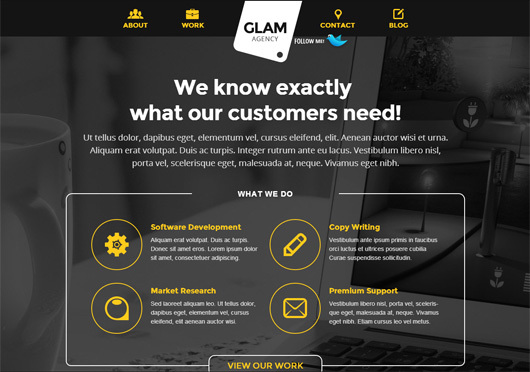 The Glam Agency is a super quality HTML5 template which is available to you in the one page HTML5 template style. This template contains the whole lot so that you will get all the things which can utilize for the sake of making a just right personal or corporate website of your dream. The design of the template is really eye catching and with the aid of the attractive animation along with the flying Twitter bird, responsive layout, amazing portfolio and lots of other things, it is able to give you remarkable assistance. The Live Preview button is also included so that you become able to check it thoroughly before buying it. 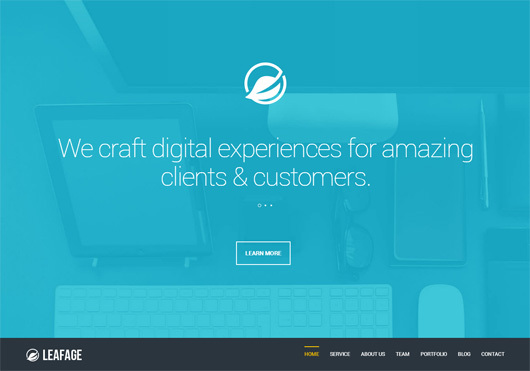 The Dimensound is a marvelous Flat HTML5 template which will come in front of you in the Flat style. The main purpose of this template is to serve the professional the basic project, of whom is related to the music and brand ideas. 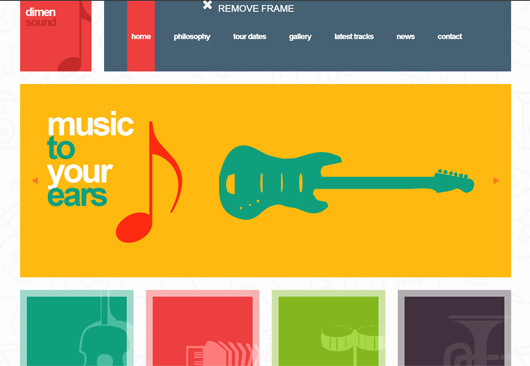 The design of the theme is very unique which is pleasing to the eye. The theme has the fully responsive layout and retina ready in addition to the compatibility with the Facebook which makes it a must have template. The users who like to display the visual portfolios directly on their Facebook Fan Page must try this theme at least one time. You are able to customize this theme with the proper assistance of its 6 great modules and a powerful background galley that you are able to utilize for the prime goal of displaying a big size work directly on the homepage. With the aid of this significant theme, you can boost your Facebook corporate presence in the way which you like because it is decorated with the Minimal Layout & Elegant design that your visitors will definitely like. 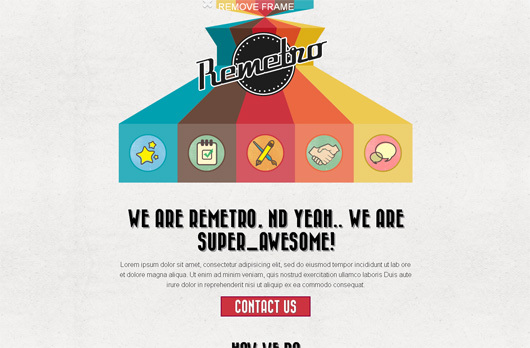 The Remetro is wonderful theme which is available to you in the shape of a single page portfolio that you can employ for the sake of showing your breathtaking work in an old retro style that will definitely grab the attention of your visitor in his very first glance. It is combined with the up to date metro style aspects all in a single page of absolute awesomeness which will bring a supreme quality appearance for your web. This theme is available to you in the 810px Wide format that’s why the Remetro is fully Facebook compatible. Most of the pro web designer is looking for the modish features in any WordPres theme which include the Layout Builder, Slider Manager, Powerful Admin Panel, Menu Manager, SEO Optimization facility along with the AJAX and the making of this theme has done after taking into account all of these useful things. After testing this theme, you will come to know that it is a cross platform and mobile friendly due to the reason that it contains the jQuery library for transitions as well. 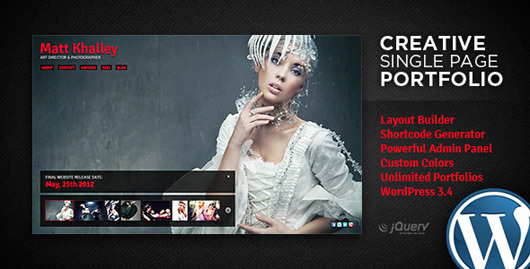 So if your web project includes the jobs of showcasing the visual portfolios then this theme suits you the best. Are you looking for a smart, simple and fast one-page RESPONSIVE HTML5 & CSS3 template for the completion of your web project in the way which you like? 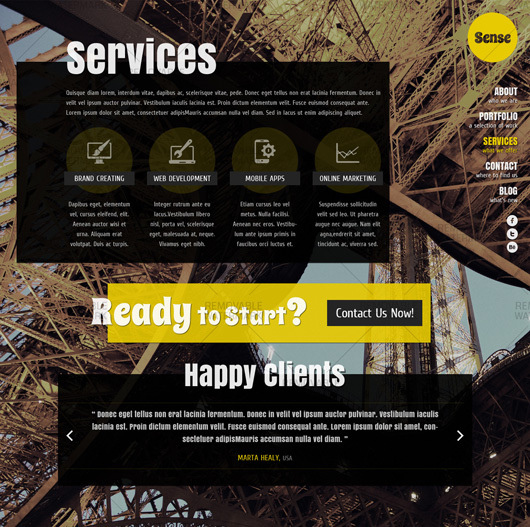 Then you must check out the marvelous services of the Sense template. It is well furnished with the parallax scrolling effect that makes the 3D effects in order to make the environment of the web very special in the eye of the viewer. You are able to make use this theme for the sake of making the personal portfolio, design studio, business organization and lots of other kinds of web assignments in an easy and a trouble free mode. This is a complete & Comprehensive template that can be utilized in order to showcase the visual portfolios in the way that will grab the attention of the viewer in an instant. You are given a total of 7 modules here that will assist you well for the prime purpose of making the modification of your choice. This is a mobile friendly theme that can be viewed easily on cross platform since the jQuery library for transitions is included in the theme package in addition. 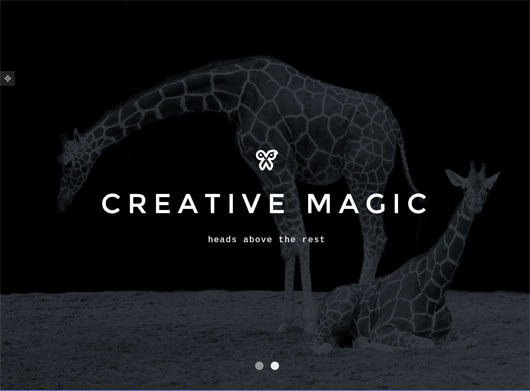 The theme will come in front of your visitors in the form of the elegant design and minimal layout.